As per his orders, the tomb remained magically sealed after his funeral – sealing in the few mourners who could be forced to the occasion at spear-point. The half-complete structure that the tomb was built into never did get completed and was slowly overbuilt with other structures and then became the foundations for Sandorne Citadel. With the loss and destruction of the citadel in the war, the area has become savage badlands again, with the ruined stone walls poking out of overgrown bush. 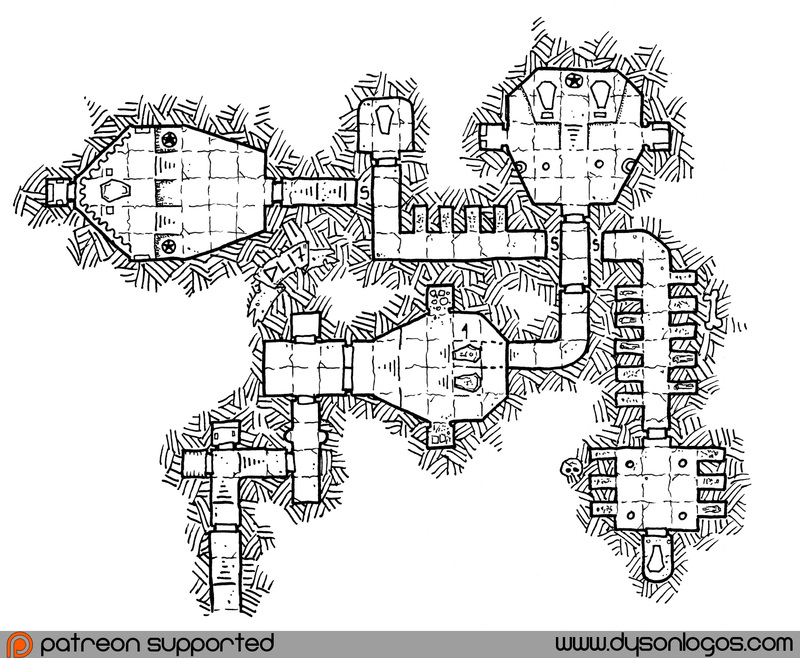 But if one had the right maps and a knock spell, they could find the entrance to the tombs. And from there, one might even know to look for a tomb beyond it – for no one would expect Lord Dranoel to be exactly where he said he would be. In fact there are multiple false tombs. The initial tomb can have the left sarcophagus pushed aside to open a secret passage to a trapped false tomb that appears to have both Lord Dranoel and his wife’s sarcophagi present. But in fact only his wife is here, along with the corpse of her lover. Secret passages from here lead to Dranoel’s architect’s tomb on the right and his majordomo’s tomb on the left – as well as a further secret door leading to the (also trapped) actual tomb of Lord Dranoel. Love all the old school RPG maps!